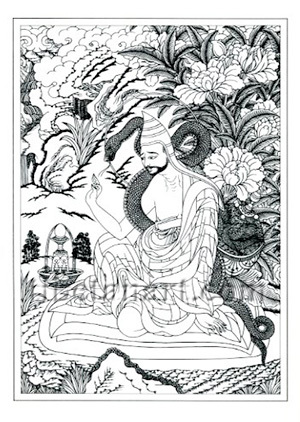 A set of twelve B/W Notecards with line-drawings by Robert Beer, which depict some of the most important Indian and Tibetan Buddhist lineage holders and gurus. The Notecards come with envelopes, and have a short biography of the lineage master depicted. Priced at £0-70 each, or £5-40 for the full set of twelve. Abhayakaragupta (Tib. Jigs-med 'Byung-gnas sbas-pa), was one of the last great Indian Buddhist masters who flourished in Eastern India around the turn of the 12th century. Under his guidance many important texts were compiled and translated into Tibetan, and he was instrumental in synthesizing the philosophy of Madhyamaka with the Mantrayana or tantric path.